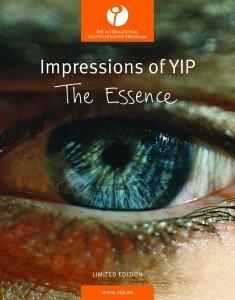 The student run project, ‘Impressions of YIP- The Essence,’ is ready for purchase! The Essence is a limited edition publication, as there are only 700 printed copies in existence. Each copy is 150 SEK, and all proceeds go to The International Youth Initiative Program. Shipping is included. There will be two opportunities for shipment: Monday, June 23rd and Monday, July 14th, so make sure that you place your order soon. A third shipping date set for August is NOT guaranteed! As many of you now know, the being of YIP will be taking a rest. The runnings of YIP7 have been postponed until further notice. This compilation of stories pays tribute, as well as celebrates, the end of an era, and of the being that YIP is as we know it today. You also have the opportunity to work with one of the higher purposes of this body of work. The stories that are compiled here are not meant to sit on any one person’s shelf, they are meant to be shared and moved from one pair of hands to the next. If you would like a copy just for yourself we recommend buying two, with the intention of sending one out on a journey of its own. Pass a copy along when you come across an individual who you feel is ready to harness the strength of these stories, and encourage them to pass it along when their walk with these words feels complete. Through this movement we have the opportunity to use ‘The Essence’ as a tool to fuel and work with the strength of true and dear connections. Within every book, there is space provided for every person to write their name, email, and country so that future readers can visualize the journey that the book has taken and reach out to those who have also been moved by this work. In this way, the ripple effect of these words and images can be felt throughout the world.